The Apache Hadoop software library is a framework that allows for the distributed processing of large data sets across clusters of computers using simple programming models. 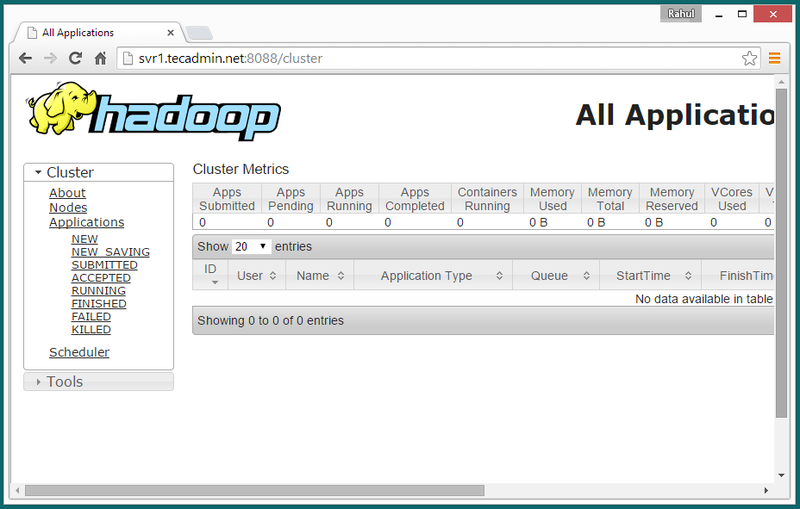 Our earlier article about hadoop was describing to how to setup single node cluster. This article will help you for step by step installing and configuring Hadoop Multi-Node Cluster on CentOS/RHEL 6. Before installing hadoop make sure you have java installed on all nodes of hadoop cluster systems. If you do not have java installed use following article to install Java. Edit /etc/hosts file on all master and slave servers and add following entries. It’s required to set up hadoop user to ssh itself without password. Use following commands to configure auto login between all hadoop cluster servers..
Download hadoop latest available version from its official site at hadoop-master server only. First edit hadoop configuration files and make following changes. Set JAVA_HOME path as per your system configuration for java. After updating above configuration, we need to copy the source files to all slaves servers. Go to hadoop source folder on hadoop-master and do following settings. 13/07/13 10:58:08 INFO common.Storage: Image file of size 112 saved in 0 seconds. 13/07/13 10:58:08 INFO common.Storage: Storage directory /opt/hadoop/hadoop/dfs/name has been successfully formatted. Apache Hadoop 2.6 significant improvements over the previous stable 2.X.Y releases. This version has many improvements in HDFS and MapReduce. This how to guide will help you to install Hadoop 2.6 on CentOS/RHEL 7/6/5 and Ubuntu System. This article doesn’t includes overall configuration of hadoop, we have only basic configuration required to start working with hadoop. Java is the primary requirement for running hadoop on any system, So make sure you have Java installed on your system using following command. If you don’t have Java installed on your system, use one of following link to install it first. We recommend to create a normal (nor root) account for hadoop working. So create a system account using following command. After creating account, it also required to set up key based ssh to its own account. To do this use execute following commands. Lets verify key based login. Below command should not ask for password but first time it will prompt for adding RSA to the list of known hosts. Now download hadoop 2.6.0 source archive file using below command. You can also select alternate download mirror for increasing download speed. 15/02/04 09:58:57 INFO common.Storage: Storage directory /home/hadoop/hadoopdata/hdfs/namenode has been successfully formatted. Lets start your hadoop cluster using the scripts provides by hadoop. 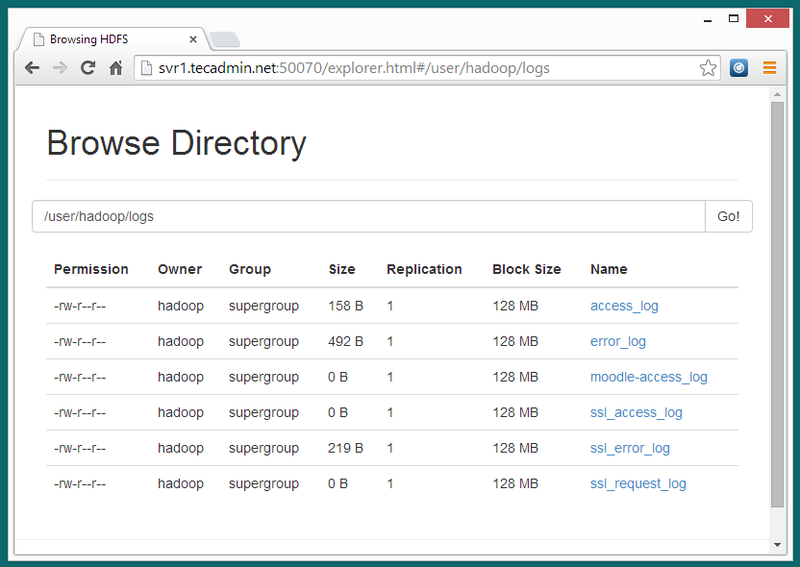 Just navigate to your hadoop sbin directory and execute scripts one by one. The authenticity of host '0.0.0.0 (0.0.0.0)' can't be established. RSA key fingerprint is 3c:c4:f6:f1:72:d9:84:f9:71:73:4a:0d:55:2c:f9:43. 0.0.0.0: Warning: Permanently added '0.0.0.0' (RSA) to the list of known hosts. Hadoop NameNode started on port 50070 default. 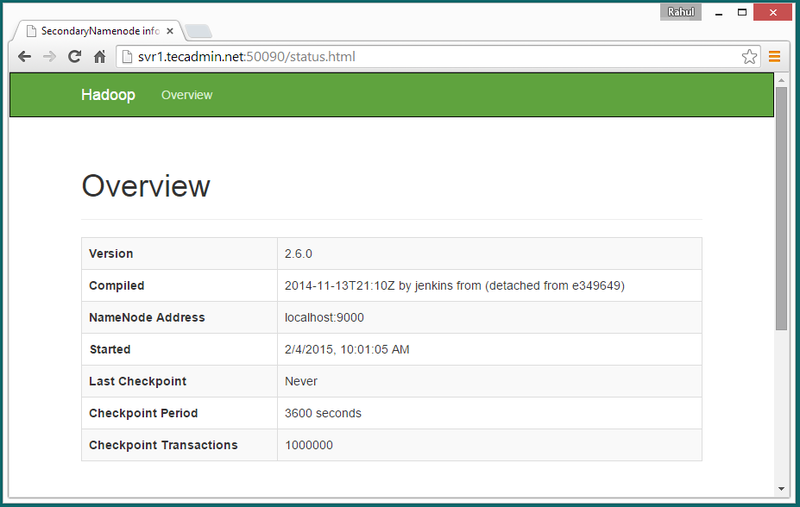 Access your server on port 50070 in your favorite web browser. 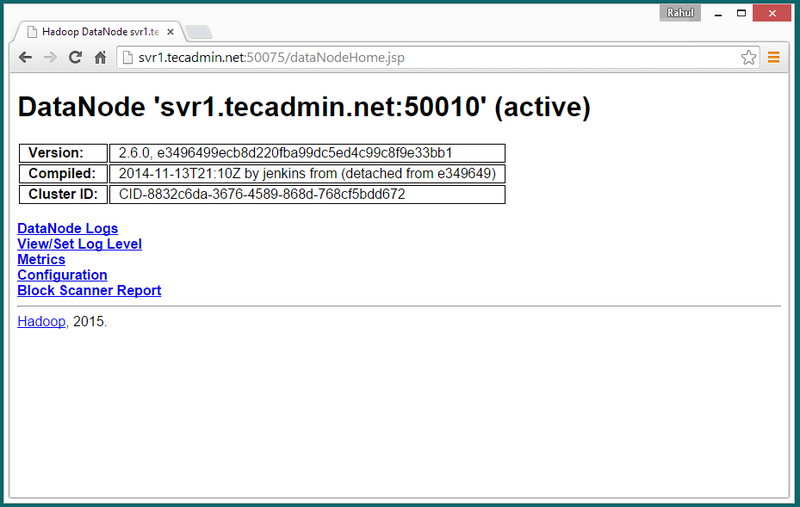 Access port 50090 for getting details about secondary namenode. 7.1 – Make the HDFS directories required using following commands. 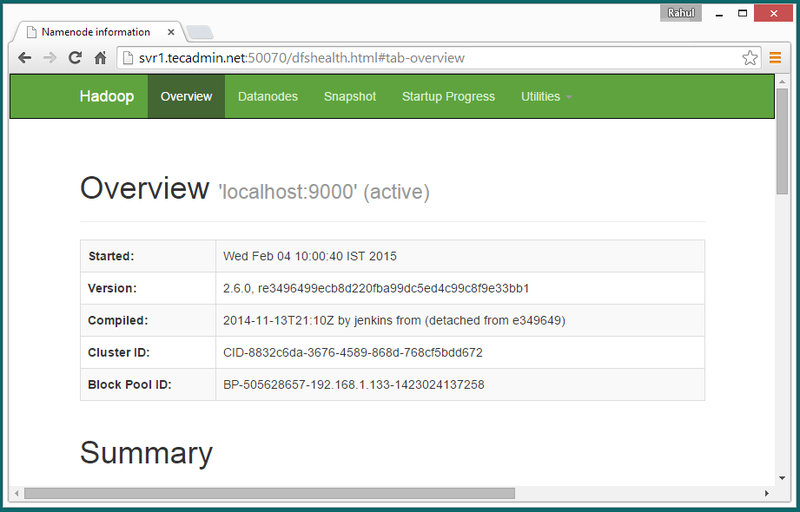 7.3 – Now browse hadoop distributed file system by opening below url in browser. 7.4 – Now copy logs directory for hadoop distributed file system to local file system. The following tutorial aims to provide you a simple step-by-step guide for setting up MySQL (Master-Slave)Replication in RHEL 6.3/6.2/6.1/6/5.8, CentOS 6.3/6.2/6.1/6/5.8 and Fedora 17,16,15,14,13,12 using latestMySQL version. This guide is specially written for CentOS 6.3 Operating System, but also work with older version of Linux distributions with MySQL 5.x. We have two servers, one is Master with IP (192.168.1.1) and other is Slave as (192.168.1.2). We have divided the setup process in two phases to make things easier for you, In Phase I we will configure Master server and inPhase II with Slave server. Let’s start the replication setup process. 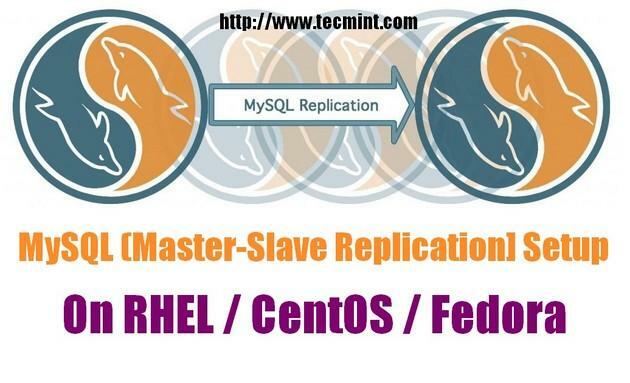 Login into MySQL as root user and create the slave user and grant privileges for replication. Replace slave_userwith user and your_password with password. Add the following entries under [mysqld] section and don’t forget to replace IP address of Master server,tecmint with database name etc, that you would like to replicate with Master. It's really very important to know that the replication is working perfectly. On Master server create table and insert some values in it. That's it, finally you've configured MySQL Replication in a few simple steps. More information can be found atMySQL Replication Guide.